I teach jewelry classes at a lovely place -- an unlikely venue called Evergreen Cove Holistic Learning Center here in Easton, MD. Evergreen Cove has a long list of wellness services -- yoga, acupuncture, reiki, and homeopathy just to name a few. It's a beautiful, intimate waterfront campus and I love how peaceful it is. 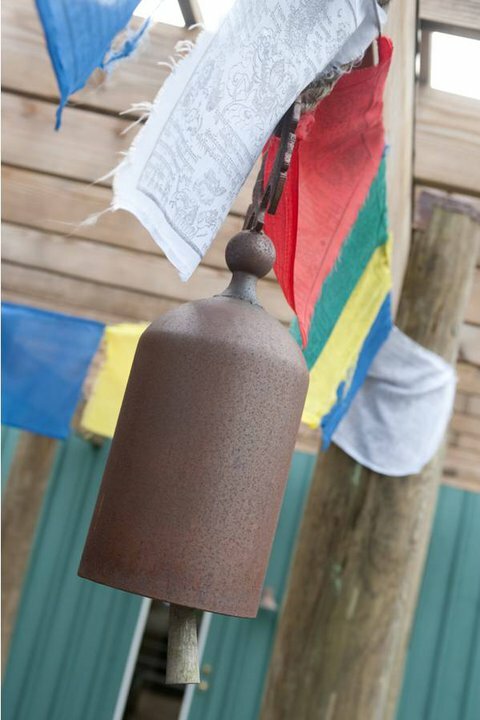 Bell and banner on the front porch at Evergreen Cove. 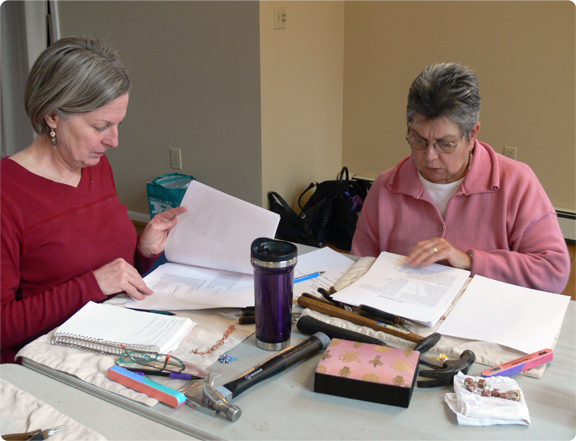 One of the very cool things Evergreen Cove offers is creativity classes. This is where I took metalsmithing classes, and it's where you can take everything from mosaic making to journaling to knitting and weaving. This Saturday, I taught a group of women how to make a copper charm bracelet, using free-form techniques as well as standard techniques, like how to make a scroll with wire. 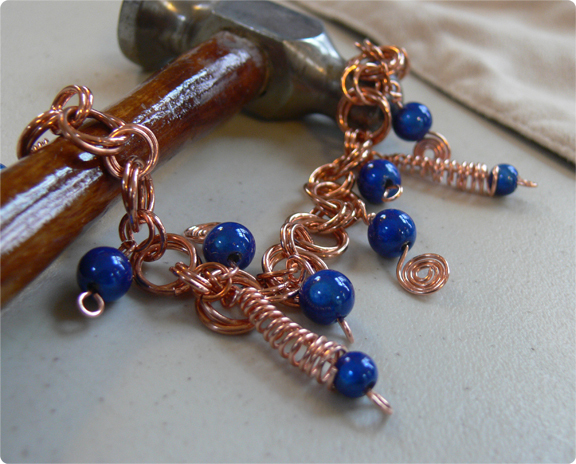 I made them each a copper chain via chain maille, gave them three gauges of wire to work with, a four-sided nail file with lots of various grits to file and buff with, and away we went. * A cover sheet with what we're going to do and all my contact information. * A pictorial page explaining what tools we'll be using. * Simple (a key word -- simple!) instructions for the basic things we'll do, like how to make an eye pin, etc. * A source list -- where can they get that cool hammer I was using? I felt that pictorials of charms wouldn't really do as the only source for ideas, so I also made up a lot of examples of charms. At the end of class, I drew names out of a hat, and the winner got to take them all home. At the beginning of the class, I introduce the tools, tell the students what they'll accomplish during their time with me, and above all -- set them at ease. I share with them my own experiences in classes where I've been the furthest behind. I share with them how I've been in a class and found it wasn't for me, but in each class I've taken, I've ALWAYS found something to take away that made it worthwhile. As a teacher, making yourself real is so important, especially in class mixed with veterans and complete beginners. 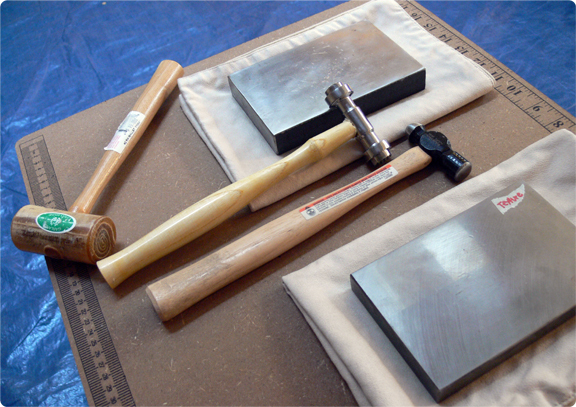 Introduction to the hammers, the steel blocks, and how to use them. The blue is a tarp to protect the yoga room's floor from metal scraps. 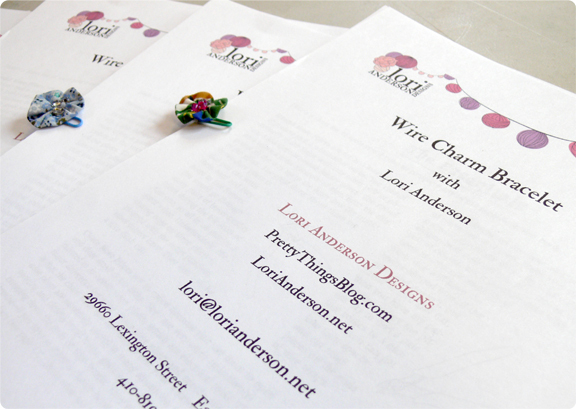 Once I've gone over the tools, I go through the information packet by showing them how to make each piece. The packet is really a reminder for when they're sitting down to work on their own, so I have them gather behind me to watch. I'm sure to go slowly and demonstrate each step, making sure each student can see, and I make sure that each piece I make builds upon the one before it. while some play and see what the wire will do. Throughout the class, we talk and laugh and share. We learn what each other does for a living. We learn about other classes people have taken. We show each other what we're doing. And the entire time, I'm there, ready to help straighten this out, remind how this works, suggest how to fix that. Every half hour or so, I ask how everyone is doing, to take the pulse of the class. If a class seems to be getting quiet, or losing its momentum, it's time to figure out why and think quickly about how to get the energy back up. 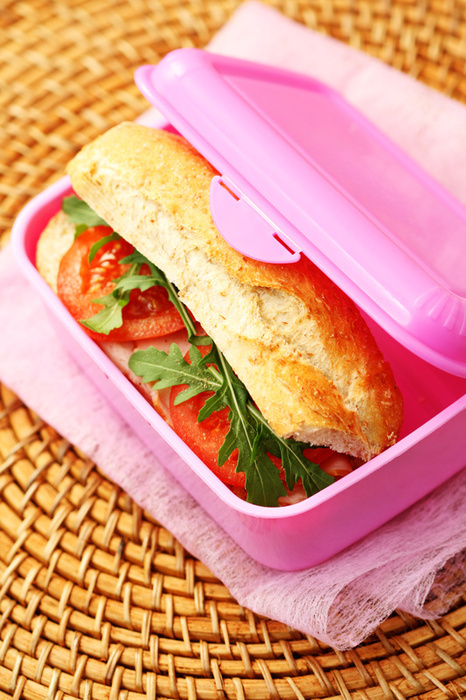 Is it time for a break, or lunch, or to show a new technique? With this group of ladies, though, I had no troubles -- we zoomed along so well we all forgot about lunch until I looked up and it was almost 2pm. In this class, I had one girl who, when I set the students loose to start, just sat and stared at her beading mat. I asked her what I could help her with, and she said in a small voice, "I just don't know where to start." I helped her with the easiest piece -- the clasp -- and once she had that success under her belt, she was off like fire. Giving a student a quick success, letting them DO on their own without taking things out of their hands, is key. When someone comes to me and asks for help, I always show them on a separate scrap of wire. If they're still looking frustrated, I ask, "Would you like me to do that for you this time? ", and I do it, explaining slowly what I'm doing, not just whipping it out fast. If the student continually comes to me asking me to do their work, then it's time for me to go back to a fundamental and work with them patiently to give them a success. Bracelet in the makings by my student who felt she "didn't know where to start". At the end of class, I do a show and tell. It's always interesting to see how things turned out. Inevitably, students will apologize for their work. I always tell them about my own experiences with making things I didn't think were to my taste, and how they would still sell, and often quicker than things I loved. I remind them this is their first endeavor. I remind them that half the fun is the practice. I remind them that at the beginning of class, they started with a coil of wire, and now look what's in their hands! THEY MADE THIS! Teaching can be very rewarding. At the end of this class, everyone was hugging, talking about forming a book club, exchanging emails, and carrying all that positive energy home with them. I won't lie -- teaching (or taking!) a class isn't always like this. You can get a real stinker -- the student who thinks they know more than the teacher; the student who can't be pleased even if you gave them the Hope Diamond to work with; the student who demands so much of our time you despair of being able to help others in the class. The key to those sorts of students is to know they exist, and have a Plan, a Plan with a capital "P". Know that often it has not a thing to do with you. Help the needy student by giving them a success (and almost everyone can accomplish at least ONE thing in a class) and then praising them to the heavens and sending them to their seat to build upon that success because, "I know you can do this, LOOK what you just DID!" And you, as a teacher, CAN DO THIS TOO. "As a teacher, making yourself real is so important, especially in class mixed with veterans and complete beginners." That's so true for anyone who is involved with teaching--making themselves real to the students. I love this! Excellent post, fabulous pictures, and great advice! I wish I could have been in that class. I'm amazed at what some of your students created - especially the one who had such a hard time even starting. Wonderful tips, wonderfully illustrated. Thank you, Lori! Thanks Lori! I am teaching my first class this week. This helped! I think I am prepared... you are so right about being "real". What a wonderful class! I have an Etsy Shop and belong to an Etsy Team here locally. 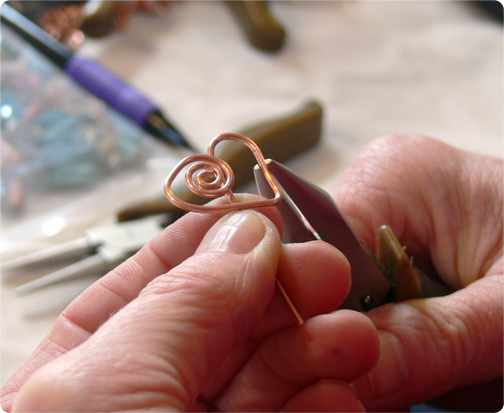 We were just talking about wire jewelry classes at our last coffee meeting on Thursday. This looks like a really fun class. Thanks for stopping by my Patricia Creations Blog and for your kind words. It is always nice to see someone appreciates your art. I'd love to take a class from you! Wow! What a great experience it must be! Great post. I could never be a teacher but would love to be a student in one of your classes. The bracelet your "beginner" made is amazing. 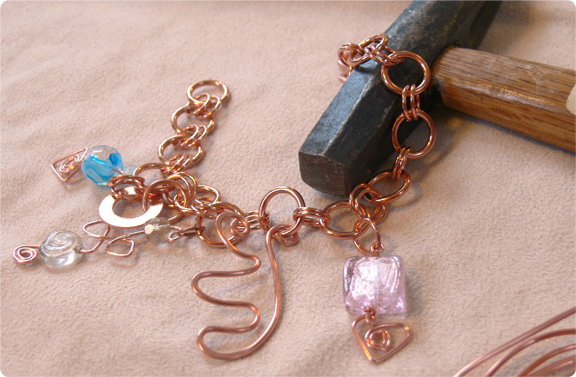 Makes me want to learn wire-wrapping. oh I like that bracelet. Love copper. Come teach in Oklahoma this year!?! Thank you! I am just thinking about teaching a class. I've been invited to teach a class at a local gallery. I have no idea where to start. This is fantastic information. I teach classes at the local parks and rec and I have had all types of classes. I have found it is good the keep the size small, I had one class that had 8 students and 4 were time hogs--no way to please them and so the other 4 were independant and didn't want to help. 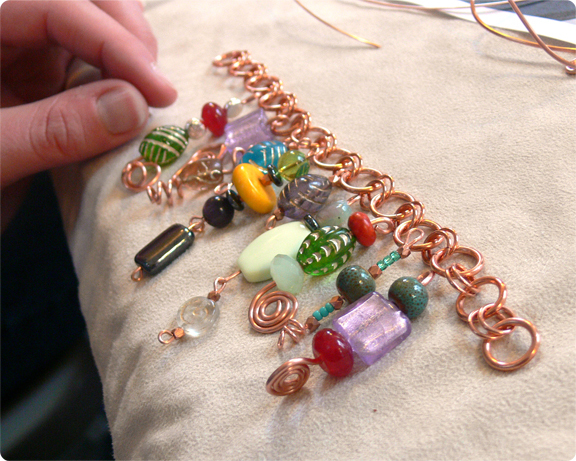 Sigh after that I lowered the class size to 6 in wire wrapping classes. Thanks for sharing this, Lori! Looks like the day was a success, Lori. It is a lot of work to put together a class. But when you love what you do, no matter what that is, you have the makings of a great teacher. I always learn so much when I come here. Thank you for sharing your successes and lessons learned along the way. Don't I wish I lived near enough to take a class from you!! You sound like a great teacher. Muchas gracias por este excelente post!!! Actualmente he comenzado a dar una clase de beading a un grupo de personas mayores. Es en una escuela y es trabajo comunitario. Para mi ha sido sumamente gratificante. Tu post ha sido de gran ayuda. Me ha ayudado a organizar muchas ideas e inquietudes que tenia. What a great post! I forgot how much I like to teach and today I'm going to call the local craft center and have a conversation with the director about scheduling a class soon. Thank you so much for the tips but for really expressing the wonderful energy of sharing our love for making with others. You are so wise and you sound like a wonderful teacher and I'm sure this was a great class for eveyone who took it from you. Glad it went so smoothly! Great post! You sound like a great teacher! Great post Lori! 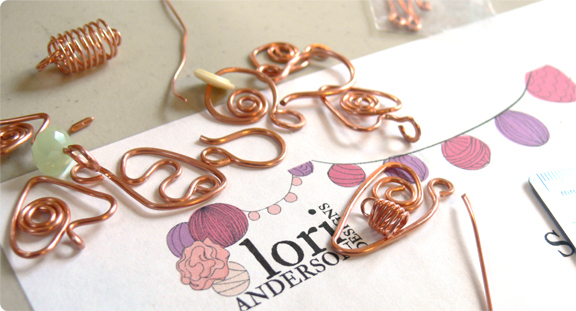 I love to teach wire classes and you hit every note perfectly. It's really rewarding when you get a great group of students. And you're absolutely right Planning is KEY! Love this blogpost, especially the pics! Where did you get that great mat with the measuring “tapes” along the edge? This is just the kind of thing I love to see, the behind-the-scene on how to share your craft with others in new ways. :) It sounds wonderful and the things that your students made are just beautiful. :) Thanks for sharing this! This is such sage advice and can be equally applied to photographic or photo editing classes and I wish everyone who teaches classes could read it. Very pretty Lori! Keep up the good work! ~Blessings! Thanks so much, I am chairman for fund raising for my local art league. We are opening a Christmas store. 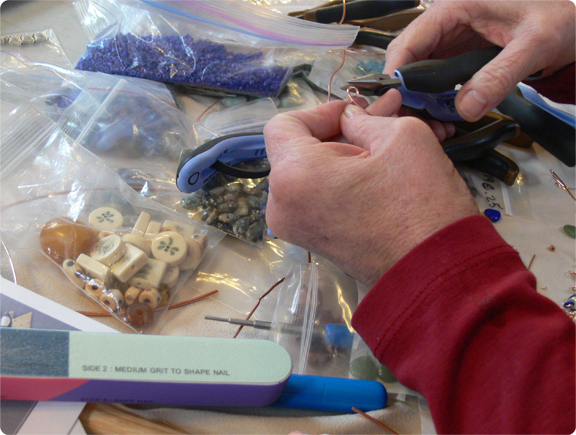 I want to have a class for making earrings on Friday evenings this was very helpful. Beautiful post well written. I like the part about planning with a P. Even though I teach design in colleges, when it comes to jewelry workshops I do get tensed at times. I found this tutorial via a search. May I just say Excellent article! I am working hard on getting my etsy shop more sales, but its slow going even though it looks great and I have a unique quality product. I read a post about branching out and your blog post has given me the strength to give something new a try. I will be reading this several times while i prepare my own jewelry course! How Inspiring! Thanks again! What is the right price to charge for the beginning classes?